In a nearly three-hour meeting during which tempers flared at times, the Miami Beach City Commission Finance Committee worked with stakeholders in the development of the Old South Shore Hospital site to hammer out a final agreement for a 44-story tower on 500 Alton Road and a 3.19 acre park deeded to the City in the 600 and 700 blocks. Earlier this year, Mayor Dan Gelber challenged the community and developer Russell Galbut to reach consensus on developing and activating the vacant lots where the shell of the old hospital that closed 13 years ago still sits. Currently, the site is approved for a 571,000 sq. ft. low-rise development with 504 units that spans the entire site with little greenspace. Gelber wrote in an email to residents last week, “If [the currently approved project] were to be developed, I believe it would increase congestion and create a ‘wall-effect’ along West Avenue.” He said the community stakeholders were close to an agreement for a 42-story tower and a 2.3 acre park. At this week’s Finance Committee meeting, Galbut said, “This is my 94th public meeting about this project and, you know what? We really are creating a record here, a real record here because this project is not being developed by an architect and a developer. It really was developed by the community.” He noted that there was consensus among the immediate surrounding condo associations with the exception the Icon, but at the Finance meeting, Brett Findler, a member of the Icon Board, said they are now supportive of the project. Starkman was referring to the requirement that the City “vacate” 6th Street to permit the allowable FAR from both sides of the street to be combined into a taller tower. Currently what is allowed on the site is a 75-foot tall, seven-story building. The vacation of 6th Street is a “technicality” according to City officials, allowing the transfer of the FAR but does nothing to change the street itself. 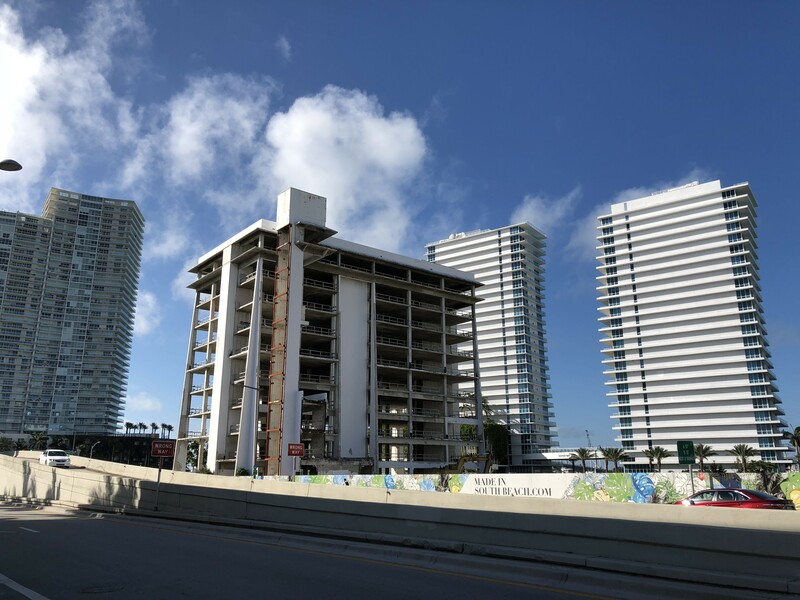 The Miami Beach Community Gateway Alliance which was started by several members of SOFNA and the West Avenue Neighborhood Association (WAVNA) originally sought a 28-story tower, a low-rise residential and/or commercial building on the 600 block, and 3.4-acre park. The group came into the Finance meeting supporting a 42-story tower with 400 units, and a 3.19 acre park designed and built by the developer. The meeting almost broke down over two points: Galbut’s willingness to pay for work on the Baywalk behind buildings across the street and a request that the air rights over 6th Street not be counted in the FAR that is being combined. Arriola said, “It’s an ask. You’re free to reject those asks.” He then clarified that Galbut had agreed to complete the areas of the Baywalk that he controls through ownership in the Mirador and Mondrian with the City placing an item for $5m in funding in the upcoming GO Bond for completion of the Baywalk behind four other properties, a point with which Galbut concurred. Noting the tall buildings around it, he said, “It keeps the height, scale, and character of the neighborhood in alignment.” For comparison, he showed a slide with the heights of buildings in the area. The Portofino has 44 floors, the Icon and Continuum have 42, Murano Grande 40 floors, The Floridian, Yacht Club and The Waverly 34, Bentley Bay 26 floors, and the Mirador and Mondrian 17. 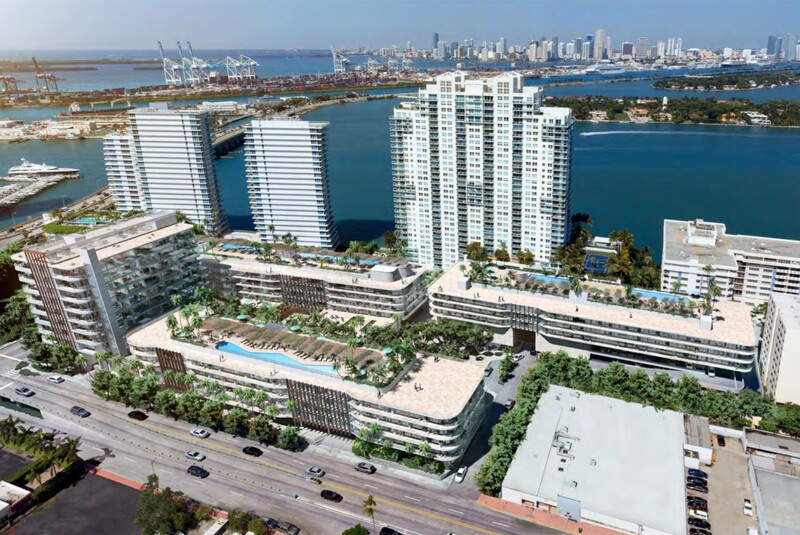 He also noted the proposed building is 190 feet wide while the Icon is 250 feet wide and the Murano 335 ft.
With the park, Galbut said, “[The project] creates the largest amount of permeable space in Miami Beach. He promised it “will be one that will be a leading resilient project for all coastal cities to come and look at in the future, if we’re allowed to do it in the right way.” The development will collect rainwater and reuse it for landscaping purposes and will include the “ability to retain water in the event of an acute shock to the community, a hurricane or something like that,” he said. He described the park as a “meandering park”, using South Pointe Park as an example. The commercial area will include a green roof. He has also proffered an additional lane for access on Alton Road to the MacArthur Causeway and the ability to launch an eventual pedestrian bridge over 5th Street to connect the Baywalk. While calling the currently approved design “a great project,” he said, “It is not what Miami Beach should have. It’s not what this community should have. What this community should have is something very special” which is what he is currently proposing with the large park, he said. “It wasn’t our intention to build [the park] at our expense, but it was demanded of us and challenged of us by the Mayor and asked for nicely by our neighbors,” he said. Galbut acquired the South Shore Hospital “to keep an existing hospital open when Miami Beach went from four hospitals to two hospitals” but after two years, it went out of business. He said he then made the “classical error of buying additional land to bring the price down.” In total, he said he has spent $87m on the properties. “It is impossible for us to make any money from it,” he said. Citing a recent appraisal of the property, he said, “$65m is what the City is getting” in land value when the park is deeded over. When Commissioner Mark Samuelian proposed continuing the dialogue over the August recess and having another Finance Committee meeting to review the details of the deal, Galbut said he would take the Baywalk contribution off the table. He was looking for a unanimous vote of the Committee but said he was willing to take a 2-1 vote to move the item onto the Commission agenda in September. Arriola said, “Nothing kills a deal like time so the more we delay this, the more likely that the factions that have been brought to the table and agreed start falling apart.” He proposed coming to substantial agreement and allowing staff to negotiate finale terms to bring to the Commission in September. As tempers flared again over terms and timing of a vote, Arriola asked for a brief recess. Following the break, the groups got back to negotiating the size of the park. Galbut said he was willing to design, construct, and deed to the City a 3+ acre park and reduce the retail component to 15,000 sq. ft. in exchange for a 44-story tower with 410 units, and a total of 571,000 sq. ft. He also agreed to finish the park before receiving a Certificate of Occupancy for the residential tower. He affirmed his willingness to construct the Mondrian and Mirador Baywalk connections provided the City contributes the $457,000 in developer’s escrow funds that it has been holding and the $375,000 the City had already earmarked for the Baywalk. Under those terms, he agreed to fund the remaining costs. Following another brief recess, Samuelian was willing to accept the redlined agreement and voted with Arriola and Commissioner John Alemán to instruct the Administration to draft a development agreement that allowed for the vacation of 6th Street and other ordinance changes to send to the Commission for first reading in September. First there’s a stop at the Commission’s Land Use and Development Committee on Tuesday. The road will not be easy. In addition to a 4/7th vote of the Planning Board, the deal will require a 6/7th vote of the City Commission. The original proposal called for a parking garage on the west side of the property required for The Floridian with a green roof. In the new proposal, the garage is moved underground to the east side with a grade level park on top. Still open is Del Vecchio’s request for a ban on neighborhood impact (entertainment) establishments in the area, no short-term rentals, and ensuring the site is not used for construction staging other than construction for this particular project. Note: The renderings above reflect the project going into the meeting (e.g. a 42-story tower and a 2.3 acre park).